Writing a bunch of words down in some semblance of order is a challenging and involved process, but it’s only the first step of crafting a story. * Practically no one can sell a first draft, and frankly you shouldn’t try. First drafts do not represent your best work. They’re full of grammatical errors, plot holes, missing scenes, and all manner of other problems. So, how do you go from that to something people might pay money to read? The answer is feedback, lots of feedback. If everytime you send out a story, you get notes back saying “this is great, don’t change anything,” something is amiss. Either you’ve gained the godlike power to write a perfect first draft, or your readers are being too nice. I’ll leave it up to you to decide which is more likely. Feedback has to tell us what’s wrong with our story, and some people aren’t able to do that. This could be because they’re afraid of hurting our feelings, or because they’re just uncritical of what they read. Either way, it’s not helpful. Rest assured that once your story is out in the world, readers will be eager to point out any problems, and by then it’s too late. Other writers can be useful in getting critical feedback. They know what to look for, and can pinpoint problems that non-writers miss. At the same time, it’s important to get a general reader’s perspective as well. Someone who writes similar stories to you might gloss over a confusing or inconsistent passage because their genre-savvy brains are automatically filling the gaps. If you don’t personally know a lot of people who can give critical feedback, then get thee to the internet! * There are countless critique groups and online workshops out there that won’t hesitate to tell you exactly what you’re doing wrong. Just be careful not to confuse critical with snarky. If the feedback goes beyond saying what’s wrong with a story and starts making jabs at you personally, it’s no longer helpful and you should move on. Once you find a reliable source of critical feedback, whether online or in person, treasure them. These are the people who will help you get your writing where it needs to be, and their value cannot be underestimated. If you’re the kind of person who never gets discouraged, then you can skip this section. For the rest of us mere mortals, the process of getting critical feedback is bruising to say the least. We pour our hearts onto the page, only to be told exactly how it wasn’t good enough. This process is absolutely necessary, but that doesn’t make it any more pleasant. It’s all too easy to lose motivation when your work comes back covered in red, and that’s something we want to avoid. The most effective remedy is to have someone who simply enjoys your work. That’s why most of us became writers in the first place. There are few experiences better than another human being looking at the words you put down and smiling. This might sound like gratuitous ego stroking, but it’s a vital component to keep us writing. Since most people reading this have to eke out writing time from the tiny bits of their schedule that aren’t already filled with work, child care, etc., a bit of encouragement goes a long way. We can’t always afford to wait for a story to be fully polished before knowing that someone thinks it’s worth reading. Just don’t let said encouragement make you complacent. It’s a motivational tool, not an excuse to claim your work needs no improvement. This sounds simple enough, but many writers have trouble with it. When you’re receiving feedback, don’t argue. Don’t defend, don’t explain, don’t justify. This is more difficult than it seems. When someone tells you that the romance you spent months on isn’t working, the urge to refute them is powerful. “My characters were meant to be together,” you’ll want to say. “You don’t get it because you’re a prude/sexist/loveless misanthrope!” Don’t say that. Don’t even give your explanation on why the love story just has to be the way it is because of X, Y, and Z reasons. The thing is, you might be right, but it doesn’t matter. Sometimes people give you feedback that’s way off the mark, but you still shouldn’t argue. Once your story is out in the wider world, you won’t be able to find every single person who doesn’t like it and explain why they’re wrong. All arguing will accomplish is make people less likely to give you feedback in the future. Think about it, would you comment on someone’s story if they responded with a 15 minute defense? These people took the time to read your work; the least you can do is let them say what they think without interruption or rebuttal. The best practice while receiving feedback is to smile, say thank you, and make a note of the critique for later. You can ask for clarification, but that should usually be it. If the person giving feedback is willing, you can lay out what you were trying to do and ask for more pointed advice on how to accomplish it, but be careful. The line between soliciting advice and arguing is a thin one. Sending out a mass email with the subject “I wrote a story, give any and all feedback” might be tempting, but it’s rarely a good idea. For one thing, you want to keep some readers in reserve so they can look at a second or third draft with fresh eyes. For another, different people are better or worse at different kinds of feedback. You might know one person who can spot grammatical errors with laser precision, but doesn’t understand character development at all. Another could be perfectly in tune with the plot, but completely miss that you accidentally changed the main character’s name in chapter three. The longer you work with people, the better you’ll know their strengths and weaknesses, and you should weigh their feedback accordingly. If Grammar Man and Plot Lady disagree on how well your story thread is working, it’s not hard to see which you should go with. Your story will also need different kinds of feedback based on what stage it’s at. When the e-ink is still drying, you might be open to drastic plot edits that completely change what the story is about. After it’s been through six drafts, you’re not as likely to want such radical suggestions. Giving your readers an idea of what you want saves everyone time and effort. If you’re particularly struggling with a single character, ask someone to read the work with that in mind. 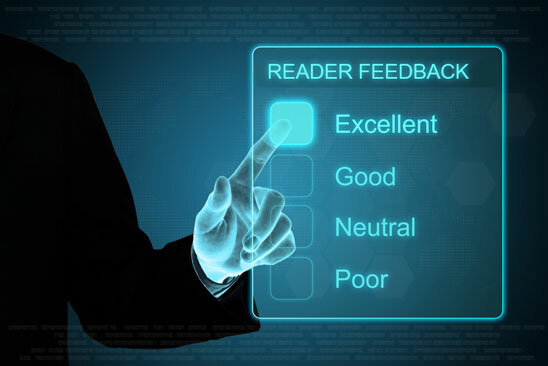 The feedback you get will be focused and more likely to provide helpful suggestions. The most surefire thing you can do to get feedback is to give feedback. We authors operate largely on the favor economy, and people you give feedback to will be eager to pay off the debt. In many online writing groups, this is a requirement. You can only post your own work once you’ve commented on a certain number of other people’s stories. If you’re in a less formal situation, like say with a handful of buddies who all work on a spec fic blog together, this is still the way to go. You’re asking people to take time out of their already busy schedule (time they could spend writing instead) to look at your work. The least you can do is offer to do the same. From a completely self-interested point of view, giving feedback also improves your own writing skills. It’s no secret that teaching is a great way to learn, and giving feedback works the same way. When you see the places where other authors need improvement, you learn to recognize them in your own work. This is an essential part of the writing process that no storyteller should skip. Even if the people giving you feedback aren’t prose writers themselves, chances are they have some kind of creative endeavor that needs a second pair of eyes. Offer to look over their film script or comic storyboard. It’s fun to branch out once in a while. It’s surprising how often beginning writers arrange to get the best critical feedback from knowledgeable readers, and then never do anything with it. They either become convinced the work is perfect the way it is or that it’s a complete waste of time and throw it away entirely. Neither outcome is desirable. It’s possible that you might write something that’s great from the start, or so flawed that it’s beyond redemption, but both are extremely unlikely. Much more common is that you have a story with promise that needs some work. That’s why you asked for feedback in the first place. Still, it’s tempting to ignore any feedback that requires major changes. You’ve already spent hours and hours on this story, and now they want you to put MORE time into it? The supremely confident will declare their story needs no changes, and the rest of us will toss it in the reject bin. We have to train ourselves to remember that finishing the first draft is not the end of the work. Rewrites are a part of the process, and we have to be willing to make them. Remember that the whole reason you ask for feedback is to know what needs changing. Let go of your ego and make the necessary modifications. I promise I wasn’t just messing with you. Everything in the previous section is still true, except when it’s not. It’s inevitable that no matter how good your readers are, they’ll eventually give you a piece of feedback that shouldn’t be implemented. They might suggest that you include a piece of tech because they really like that tech, not because it will make the story better. * Or they might have personal experiences or prejudices that make them see the story differently than other readers will. Whatever the reason, sometimes you’ll get suggested changes that are just wrong. When this happens, you still shouldn’t argue. * Thank the person for their feedback, then ignore it. Of course, there’s a trick to this. How are you supposed to know when a bit of feedback is actually wrong and when it’s just your authorly pride rearing up? The most direct way is to ask people. If you get a suggestion that your epic space opera should actually be set in a Tolkien-style high fantasy world, ask some of your other readers about it. Who knows, you may have accidentally written a new Lord of the Rings and stuck some space ships in it by mistake. Or it might turn out that this was a bad suggestion made because someone had just done a Game of Thrones marathon the previous evening. The good news is that telling the difference between good feedback and bad gets easier with experience. Managing feedback is a skill just like writing words, and you’ll get better at it. In fact, the same could be said for any entry on this list. As your writing improves, you’ll develop a stable of dependable readers to make it even better. They’ll point out where you’ve stumbled and give you a hand up. These people are incredibly valuable, and you should do everything you can to cultivate them. Maybe the second step, depending on how detailed your outlines are. Well, a different part of the internet, unless you’re reading the stone tablet edition of Mythcreants. By the way, have you considered putting airships in everything you write ever? There are some great tips in this post! Do you have any suggestions for good writing critique groups? I love having other people read the stories I write but I have a limited number of friends who are actually willing to critique on a regular basis. I haven’t had great luck with those either. The strategy that worked for me was to start writing for a speculative fiction blog and then bug my fellow bloggers into looking at my stuff. Since that’s kind of a specialized path, I would recommend searching online. There are plenty out there, and you don’t risk any real relationships if they don’t work out. Great advice. I try to have at least three (max. 5) readers read every draft. The more different they are the better. Sometimes I even pay for it.